(CNN) -- Greece international central defender Sotirios Kyrgiakos has completed his transfer to English Premier League side Liverpool after signing a two-year contract with the club. Liverpool manager Rafa Benitez has turned to Kyrgiakos because of defensive injury worries. The 30-year-old has passed a medical to finalize his switch from AEK Athens, and will go straight into the squad for Monday's home match against Aston Villa at Anfield. He is likely to partner Jamie Carragher in the heart of Liverpool's defense, taking the place of teenager Daniel Ayala who made his full debut in Wednesday's 4-0 win over Stoke. Liverpool manager Rafael Benitez is without two key defenders through injury. Danish center-back Daniel Agger will have an operation on his back in Germany on Tuesday, and will be out for six weeks while Martin Skrtel is still struggling with a damaged jaw, sustained at Tottenham last weekend, and is not expected to be fit to face Villa. Benitez has been searching for defensive cover for weeks, having tried to sign Stoke's Ryan Shawcross and Hull's Michael Turner. He was also linked with West Ham's England defender Matthew Upson. But Liverpool's American owners George Gillett and Tom Hicks are believed to have put the block on any further major signings, meaning that Benitez has had to search for the cheaper options. 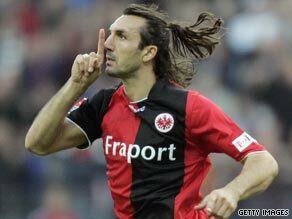 He has snapped up Kyrgiakos for just $3.3 million and Benitez said of his latest signing: "He has had experience in Scotland with Rangers and in Germany with Eintracht Frankfurt as well as with the Greek national side. Benitez told Liverpool's official Web site: "He is strong and good in the air, and we were looking for experience and he is the perfect answer." Kyrgiakos, who has been capped 50 times by Greece described his decision to move to England as "the biggest challenge of my career". The tough-tackling defender moved back to Greece in 2008 after one season at Rangers and two with Eintracht Frankfurt.